EditPad Pro is a powerful text editor for Windows. You can edit all text files with EditPad Pro. Open text files saved on Linux, UNIX and Macintosh computers, or even text files from old DOS PCs or IBM mainframes. You'll never have to worry about being unable to open a text file, and you'll always be able to save your files in a format that people with less flexible text editors can read. Many other text editors automatically convert each file you open to Unicode, and convert it back to the legacy encoding when saving. This reduces performance with large files. If the wrong encoding is used by the editor, or if the file had invalid characters, data corruption will occur. EditPad Pro reads and edits files in their original encoding. This allows EditPad Pro to open huge files instantly. EditPad Pro preserves the compatibility of all files you edit with the legacy systems that may still be using those files. EditPad Pro only converts a file's encoding if you explicitly ask it to. You can convert between any two encodings listed below. EditPad Pro handles DOS/Windows, UNIX/Linux and Macintosh line breaks. Open and save text files encoded in Unicode (UTF-8, UTF-16 and UTF-32), any Windows code page, any ISO-8859 code page, and a variety of DOS, Mac, EUC, EBCDIC, and other legacy code pages. Convert files between any of these encodings. "I am writing to tell you how pleased I am that I can now read / write / transcode sample text between Shift-JIS and UTF-8. Amazingly useful—solid software! And for the purposes of multi-language support—I simply have not found anything else that does that so simply and effectively!" You can use any keyboard layout and any IME (input method editor) for any language or script that Windows provides in the Regional Settings in the Control Panel. That includes right-to-left scripts such as Hebrew or Arabic and complex scripts such as the Indic scripts. If you set the default encoding in EditPad to Unicode, you can use all languages and scripts at the same time in a single file. You can even use exotic scripts that don't have legacy Windows code pages, or built-in support from Windows. EditPad Pro is fully compatible with all your virtual keyboard drivers, such as those created with the Microsoft Keyboard Layout Creator (MSKLC). 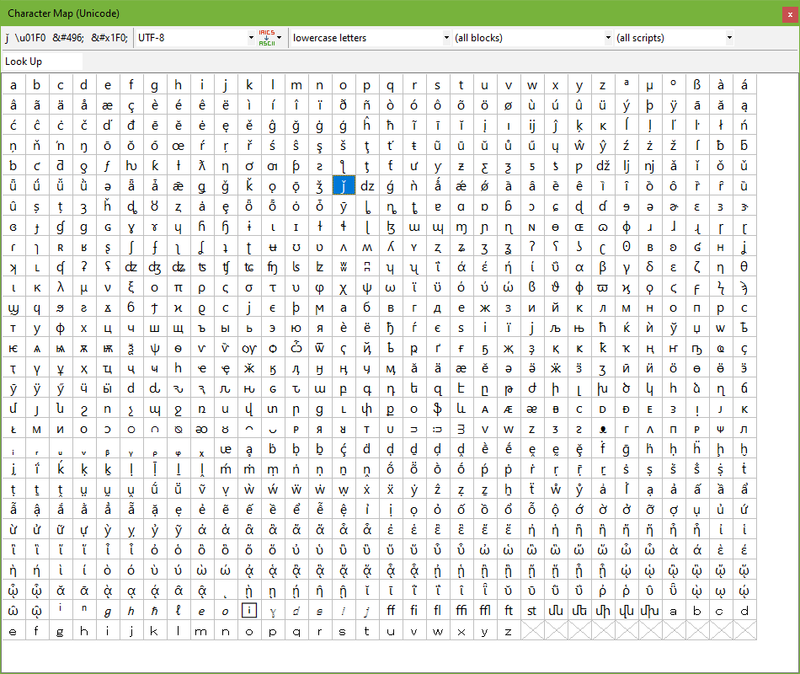 EditPad Pro's character map allows you to insert any character supported by the current file's encoding, which is very convenient for working with characters or languages that you cannot type on your keyboard. The status bar can indicate the code page numbers and Unicode code points of characters as you type or scroll through a file. EditPad Pro supports a very wide range of code pages used to save text files on Windows computers and other platforms. You can instantly convert a file between any two encodings by selecting Convert|Text Encoding in the menu, or re-interpret a file using a different encoding in case EditPad Pro's auto-detection fails. You can specify different default encodings for each file type. Unicode text files can store text in any language known to humanity. Modern globalized applications often use UTF-8 or UTF-16 to save text files. Windows applications that don't use Unicode save text files using one of the Windows code pages, often called "ANSI" code pages in technical documentation for Windows. 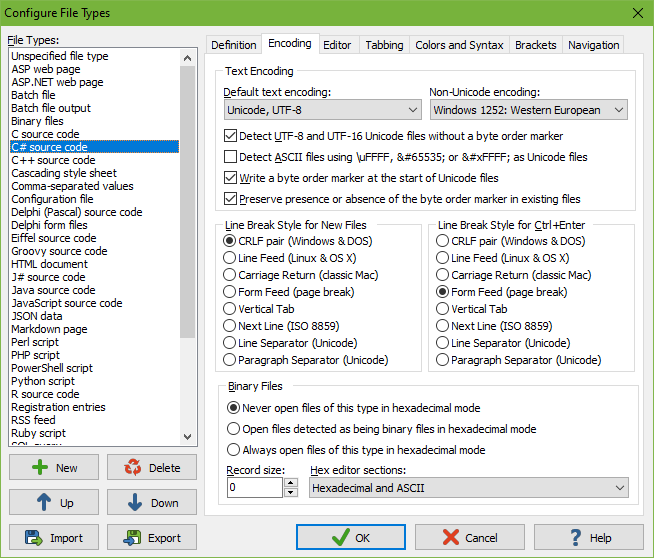 EditPad Pro supports all single byte (Western languages) and double byte (Far East languages) code pages, allowing you to open any text file created on a Windows computer. Applications that don't use Unicode running on Linux and other UNIX variants usually save text files using one of the ISO-8859 code pages. EditPad Pro supports all ISO-8859 code pages, allowing you to open any text file created on a Linux computer. EUC stands for Extended UNIX Code. These encodings were common on UNIX platform for encoding text in Far East languages that use up to two bytes per character. EditPad Pro supports the EUC code pages that were commonly used prior to Unicode. EditPad Pro can interpret pure 7-bit ASCII files in several ways. If you select US-ASCII (7-bit) you'll see pure ASCII. EditPad Pro also supports a number of ASCII-based notations. EditPad Pro will display the actual (Unicode) characters and allow you to type and paste actual characters. But the file on disk will be pure ASCII, using the selected notation to encode non-ASCII characters. EditPad Pro supports a wide variety of code pages used by the legacy DOS operating systems like MS-DOS and PC-DOS. These code pages include the famous "box drawing symbols" used by text-based DOS applications to simulate graphical menus and windows. Files created on modern Macs running OS X normally use Unicode. Files created on older Macs will probably use one of these legacy code pages. The code pages provided by DOS and Windows weren't sufficient or optimal for all languages. This resulted in a wide range of code pages used in specific regions. The KOI8 encodings are very popular for encoding Russian text files. If you receive files with text in Russian, they're likely to be encoded in KOI8 rather than in Windows 1251 or ISO-8859-5. Vietnamese files often use legacy code pages that encode all characters with one byte rather than Windows 1258 which uses combining marks. The EBCDIC encodings were the de facto standard when computer files were saved on punch cards, and are still used by mainframe systems from IBM and other vendors. EditPad Pro supports the more commonly used EBCDIC encodings. EditPad can convert text from and to several other encodings. 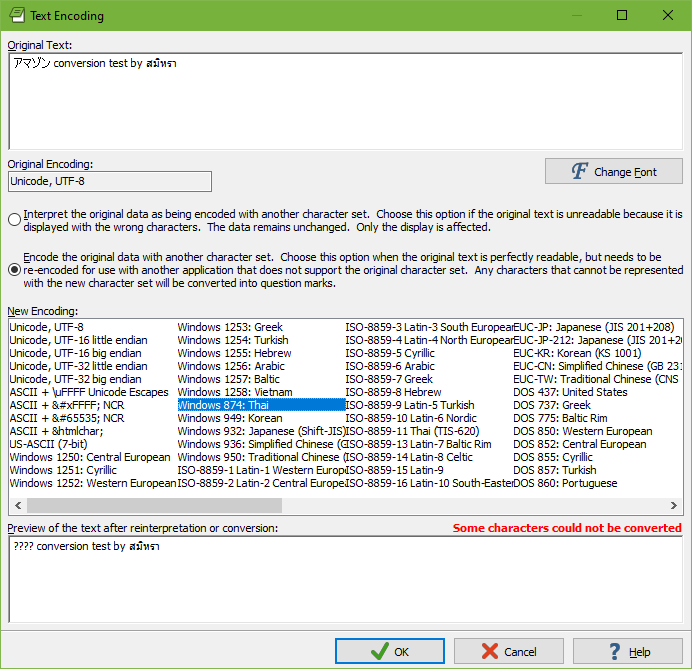 These encodings cannot be edited directly because they use partial bytes to encode characters (UTF-7), use a state mechanism that requires the entire file to be processed (ISO-2022 and HZ), or use a single byte to represent multiple Unicode characters (TSCII). If you edit a file using one of these encodings, EditPad Pro will convert it to Unicode when reading the file and convert it back into the legacy encoding when saving the file. "I'm not eloquent enough to describe fully my admiration and appreciation for such an incredible text editor, nor can I believe yet that someone has ever made it. Being a professional linguist working with various languages in various scripts, I have some complicated demand for a text editor in terms of multilingual and multiscript support. None of literally hundreds of text editors I had ever tried met my demand, until I found EditPad Pro 7. It's in my humble opinion the best (multilingual/multiscript) text editor ever made on this planet. Now I spend more time with it as my sole text editor than with any other software program. I've already started to recommend EditPad Pro to my colleagues, students and friends." "EditPad is one of very few text editors that can correctly handle [Unicode] line ending styles. So congratulation to you for adding yet another feature to EditPad that the competition doesn't have." "I've been using EditPad for several years now, and it has always been my favorite plain text editor. And since I often need to read files using different code pages, or convert between them, I'm very glad of the new Unicode capabilities of EditPad 6.0.0. I'm certainly going to use EditPad even more than before. Thank you very much, and keep up the good work!" "I am trying out EditPad Pro, and I have to say that I like it a lot - it's the best, most customizable, and the fastest general Unicode text editor I've used, and I've tried many different ones." It's no surprise that EditPad Pro is one of the few Windows text editors that you can use to edit text files in any language or script. While most text editors boldly advertise Unicode support, they often have trouble with anything outside the repertoire of Western European characters familiar to American programmers. EditPad Pro is the brainchild of Jan Goyvaerts, who grew up in Belgium, a small country in Europe. At school Jan had to study Belgium's three official languages (Dutch, French and German), as well as English. Nowadays, Jan lives in Thailand, with its unique script that writes vowels around the consonants in all four directions, rather than just from left to right. Obviously, he wants his text editor to work perfectly with all these languages.